MANILA, Philippines — Floyd Mayweather Jr.’s first day in the Philippines was like a flurry of punches – he says no to a rematch with Manny Pacquiao, but offers a game of hoops, looks to a career in UFC, rides in a luxury car, does a shoot-around with airport workers and thoroughly enjoys the white sands of a Palawan beach. The unbeaten world champion is on a world tour aboard his $3 million Gulfstream IV on a personal mission to meet and greet the boxing fans the world over. He set foot on Philippine soil in the wee hours of the morning yesterday then doused cold water on the possibility of a rematch with the Filipino eight-division world boxing champion. “I’m an old man. There’s no more fighting in Floyd Mayweather,” he said after stepping out of his private plane that brought him in from Thailand. However, Mayweather said there’s one thing he’d like to do with the Filipino superstar while he’s around – play basketball. “My love for boxing is like my love for basketball,” said Mayweather, who was met at one of the private hangars of NAIA, shortly before 3 a.m., by his Filipino hosts. He did not bite the bait regarding the rematch with Pacquiao, who’s busy training in General Santos City for a July 15 title clash with Argentina’s Lucas Matthysse. “I’m not thinking about fighting right now. Not at all. But if I do and happen to come back it would be in the octagon,” he said. Mayweather defeated Pacquiao in 2015 then raised his ring record to 50-0 by beating Conor McGregor last August. A rematch with the UFC superstar remains a possibility, but under UFC rules. 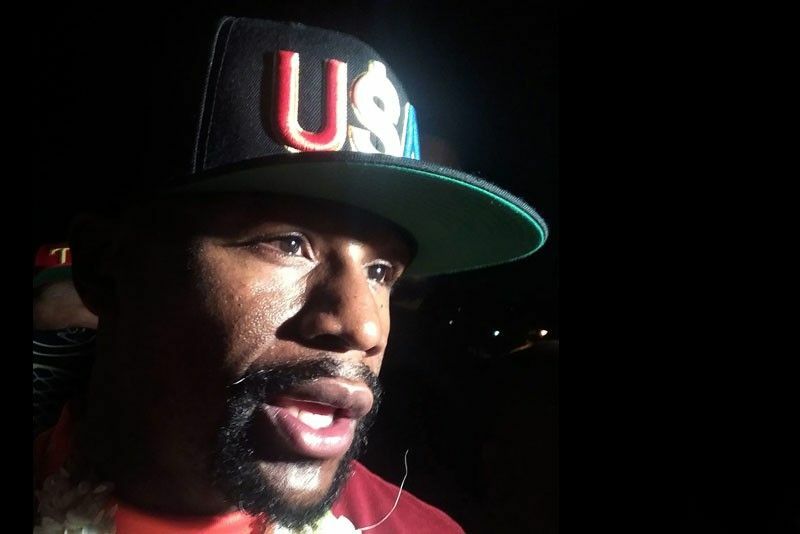 “Right now I’m not worried about the octagon or the boxing ring,” said Mayweather, with a thick lei of sampaguita, the Philippine national flower, hanging from his neck. Mayweather’s eyes looked tired and weary from the world tour that has brought him and his oversize team to Dubai, Singapore, Indonesia, Thailand and then Manila. “I’m touring the world and embracing my fans, and getting love from around the world. Right now I’m retired,” he told reporters. It was a typical Mayweather entrance – stylish, luxurious and behind schedule. He was expected to arrive in Manila at 7 p.m. Then it was moved to midnight. His private jet landed at NAIA at around 2:15 and it took him close to 30 minutes to deplane. Exotic cars, two Lamborghinis and a BMW, a Rolls Royce sedan that bore his TMT (The Money Team) logo, a Hummer that stretched 30 feet long, and a line of SUVs welcomed Mayweather. He chose to ride a Lamborghini, driven by Pinoy businessman Lester Codog, a licensed pilot and car enthusiast, on his way to the Solaire Resort and Casino, just 10 minutes away. His hosts could have done better taking Mayweather to his hotel, in the dead of the night, on board a proud Philippine jeepney. “The Philippines is such a great place with nice people. This will not be my last time here,” Mayweather, in a red track suit, told his welcomers led by Frontrow International chief Sam Versoza.